Blurb This is a 4 channel, 8-bit sound board. 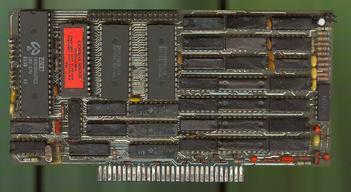 It has its own Z80 CPU onboard, running at 12MHz and 128Kb of memory (16Kb ROM and 112Kb of RAM). The card is AY-3-8910 compatible and uses a sampling frequency of 37.5KHz. Notes Nemo (author of Nemo KAY clones) and Scorpion made an improved version later. Due to the complexity of the circuit no amateur copies were made. The GS was very popular in Eastern Europe.